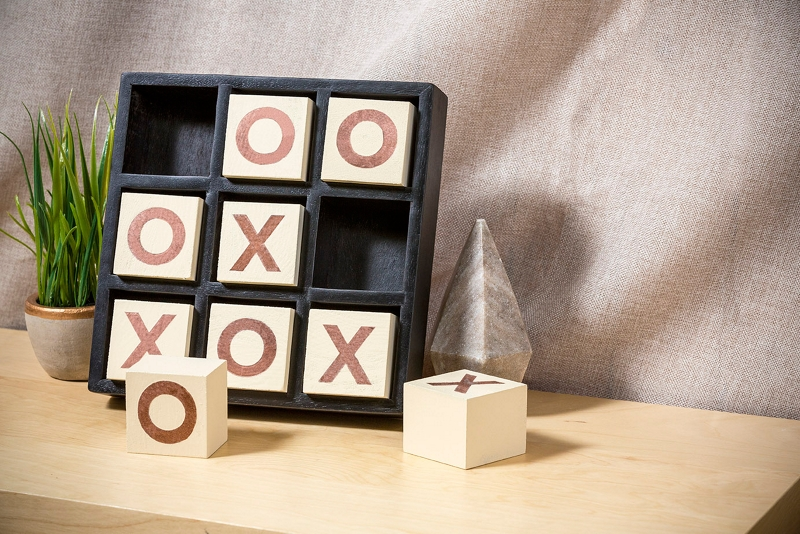 Build a tic tac toe game for your coffee table with Krylon®! Find a tray that has nine even compartments - this will be used as the game board. Measure one of the compartments to determine the block size needed. The blocks will become the Xs and Os. Find a wood board that will allow you to cut the appropriate size blocks needed for the compartments - to create the blocks pictured above, a 2 inch by 2 inch piece of wood about 3 feet long was cut into nine 2 inch equal square pieces. Mark the wood board with the measurements obtained in Step 2 adjusted as follows: the measurements marked on the board should be about one quarter less in length and width than the actual compartment measurement for ease of placement and removal of the blocks when playing the game. Also, when measuring the height of the blocks, keep in mind they should sit about ½ to 1 inch above the lip of the game to make picking up the pieces easier. Use an electric miter saw to cut the wood - make sure to wear personal protective equipment! Lightly sand the nine wooden blocks to ensure a smooth, even surface. Wipe off any remaining dust or debris using a tack cloth. In an area free from saw dust and debris, place the block pieces and game board on a drop cloth or covered surface in a well ventilated area. After reading product label for proper application and safety instructions, spray light, even coats of Krylon® Chalky Finish Paint in Colonial Ivory onto all sides of the blocks. Set aside to dry. Once the base coat on the blocks has completely dried, use letter stencils to create the Xs and Os on the top of the blocks. You can also use painter's tape to create the Xs and Os if you do not have stencils. Spray exposed area with Krylon® Premium Metallic in Rose Gold. Allow time to dry before use. Spray the game board using Krylon® Chalkboard Paint in Black - this will allow you to keep score on the game board itself with chalk! Allow time to dry before using the chalk or placing the blocks into the compartments.